Scholar and philanthropist of the third tannaitic generation (first and second centuries); disciple of Joshua b. Hananiah, and contemporary of Akiba (Ṭ. Y. iii. 4, 5; Tosef., Bek. vii. 6). Sometimes the cognomen is omitted (compare Tosef., Zab. i. 5, and Zab. i. 1), and sometimes the patronymic (Ab. iii. 7). While his name is connected with but few halakot, and with still fewer midrashim, he has established for himself an indelible name in the list of the charitable. His motto was, "Give Him of His own: thyself and what thou possessest are His, as David says (I Chron. xxix. 14): 'All things come of thee, and of thine own have we given thee'" (Ab. iii. 7); and he lived up to his motto. It is related that he was so extravagant in his benevolence as to give away all that he possessed; wherefore the collectors for the poor would avoid meeting him (Ta'an. 24a). In illustration of this characteristic, the Talmud (ib.) 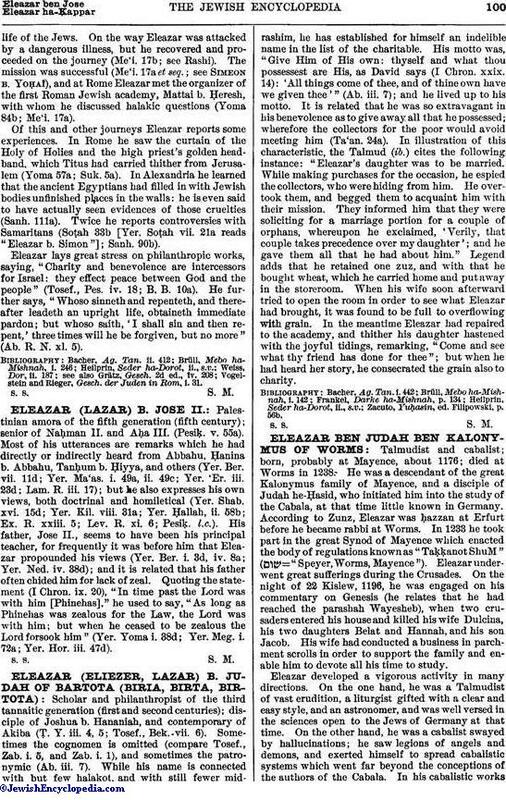 cites the following instance: "Eleazar's daughter was to be married. While making purchases for the occasion, he espied the collectors, who were hiding from him. He overtook them, and begged them to acquaint him with their mission. They informed him that they were soliciting for a marriage portion for a couple of orphans, whereupon he exclaimed, 'Verily, that couple takes precedence over my daughter'; and he gave them all that he had about him." Legend adds that he retained one zuz, and with that he bought wheat, which he carried home and putaway in the storeroom. When his wife soon afterward tried to open the room in order to see what Eleazar had brought, it was found to be full to overflowing with grain. In the meantime Eleazar had repaired to the academy, and thither his daughter hastened with the joyful tidings, remarking, "Come and see what thy friend has done for thee"; but when he had heard her story, he consecrated the grain also to charity. Zacuto, Yuḥasin, ed. Filipowski, p. 56b.